First shift: IST 9.00 A.M to 12.30 P.M. Second shift: IST 3.00 P.M to 6.30 P.M.
Physics, Chemistry, Biology (Botany & Zoology) and General Knowledge/Aptitude. Correct answer scores 1 mark and wrong answer deduct 1/3 marks. Section one: 60 marks, Section two: 60 marks, Section three: 60 marks, Last section: 20 marks. Paper Language: AIIMS MBBS 2019 exam will be conducted in both English and Hindi and candidates must make sure that they choose or indicate whether they prefer paper language as English or Hindi while filling the application form. Choice of paper language will not be changed later at any cost. Exam Duration: Duration of AIIMS MBBS 2019 examination is of 3 and half hours i.e. 210 minutes. Candidate needs to finish the exam within the allotted time only. Question paper: Question Paper of the AIIMS MBBS 2019 examination will be consisting of 200 MCQs. Marking scheme: Candidate will be awarded 1 mark for every right answer. There is a negative mark of 1/3 marks which will be deducted for every wrong answer. No marks will be given for the questions which are not answered or marked for review. Exam Center: Candidates will have the option to choose a total of 3 exam centres of AIIMS MBBS 2019 in order of priority from the total list of approximately 155 cities will be offered. The allotted exam centres will be displayed on the candidate’s AIIMS MBBS 2019 Admit Card. Modes: AIIMS MBBS 2019 examination will be conducted in online mode i.e. computer-based Test. Shifts: The AIIMS MBBS 2019 Online (CBT) Entrance Examination will be conducted in two days in two shift per day. First Shift will be conducted on Morning between 9.00 A.M. to 12.30 P.M. The Second Shift will be conducted on Afternoon between 3.00 P.M. to 6.30 P.M. The reporting time for the first shift is 7.00 A.M and for the second shift is 1.00 P.M.
No Candidates will be allowed in the examination centre after 8.45 A.M in the First shift and 2.45 P.M in the Second shift. Candidates will not be allowed to leave the examination hall before the end of exam i.e three and half hours. Carry ID proof: Candidates should carry AIIMS MBBS admit card, ID proofs and one photograph to appear in the AIIMS MBBS 2019 examination. Candidate's who did not get their Admit Card and ID proof will not be permitted to enter the examination hall. Reporting Time: Candidates are advised to reach the AIIMS MBBS 2019 examination centre at least 30 minutes before the exam time because the Candidates will put through to various activities such as biometric capture, photo capture etc. which is mandatory for every candidate who is going to attend the AIIMS MBBS 2019 examination. Prohibited Things: Candidates are advised not to carry wristwatches or any kind of electronic gadgets such as cell phones, calculator, Bluetooth devices etc. in the AIIMS MBBS 2019 examination hall. Candidates should not bring pen/pencil to the AIIMS MBBS 2019 examination hall. A pen will be provided by the examination authority at the examination centre for completing examination formalities and rough work (if any). Corrections: If any changes are required to change in Name, Address, Mobile Number or E-mail ID, Candidate should punctually report to the Assistant Controller (Examinations), AIIMS, New Delhi. Note: If a candidate is found to be copying/ conversing with other candidates, he/she will be disqualified from taking the AIIMS MBBS 2019 examination and the next one or two such examinations according to the nature of the offence. What is the marking scheme for AIIMS MBBS? What are the components of AIIMS entrance exam question paper? What is the exam pattern for the exam? The exam duration will be 3.5 hours (210 minutes). 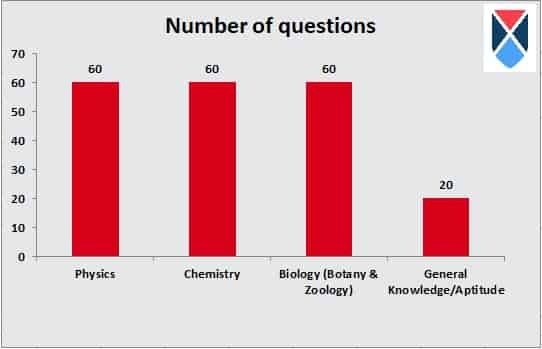 The Question Paper will comprise a total of 200 multiple types (objective) type questions. The applicant will secure 1 mark for every right answer. 1/3 marks will be deducted for each incorrect answer. The examination will be conducted in both online mode (computer based).